In June 2017, the American people learned that Russian operatives had targeted 39 state election systems in the lead-up to the 2016 elections.2 Beyond the states, Russians targeted an election equipment vendor.3 These cyberintrusions and other Election Day disruptions exposed the country’s voting infrastructure as outdated and vulnerable to attack, weakening confidence in the electoral process. One poll found that 1 in 4 Americans will consider abstaining from voting in future elections due to concerns over cybersecurity.4 Election officials at all levels of government must invest in America’s election infrastructure and defend the security of our election system. Election administrators should replace and upgrade all voting machines and components that still use outdated operating systems to new models that meet modern standards and up-to-date cybersecurity protections. Voter registration systems and equipment—including e-poll books—contain sensitive information, such as eligible voters’ political affiliations, partial Social Security numbers, and driver’s license numbers.11 If voter registration records are hacked and altered, eligible Americans may be turned away at the polls or prevented from casting ballots that count on Election Day. Election administrators must update and secure voter registration lists and e-poll books. Paper copies of voter registration lists must be made available at each polling location in order to ensure that eligible Americans are able to cast ballots that count when they show up to the polls. In addition, states should establish contingency plans with clear guidance for election officials and poll workers on switching to paper backups when problems arise. Voter-verifiable paper ballots or records are necessary for conducting meaningful postelection audits that confirm election outcomes and detect malicious activity. Paperless touch-screen voting systems should be replaced with paper ballots and optical scanners. States and localities must implement cybersecurity standards for voting machines, voter registration systems, and training programs for election officials. Because all voting machines are vulnerable to hacking and even misprogramming, it is of the utmost importance that election officials commit to conducting robust audits after every election in order to confirm election outcomes and to detect manipulation of vote totals. Testing should be conducted on all election machines and equipment prior to the start of early voting and Election Day, performed enough in advance to allow for effective remediation. Furthermore, testing should take place in a public forum with appropriate public notice, thereby increasing transparency and public confidence. Submitting ballots online is risky because there is no way for voters to confirm that the vote they cast is the same as that ultimately recorded.. While it is important for states to retain a level of autonomy over the administration of their elections, many lack the personnel and resources necessary to thoroughly probe and analyze complex election databases, machines, and cyber vulnerabilities. State officials—who are more familiar with the intricacies of their local systems—and federal agencies must work together to protect the security of our elections. By combining their expertise on cybersecurity threats and insight into the unique qualities of localized election infrastructure, they can better assess and deter attempts at electoral disruption. 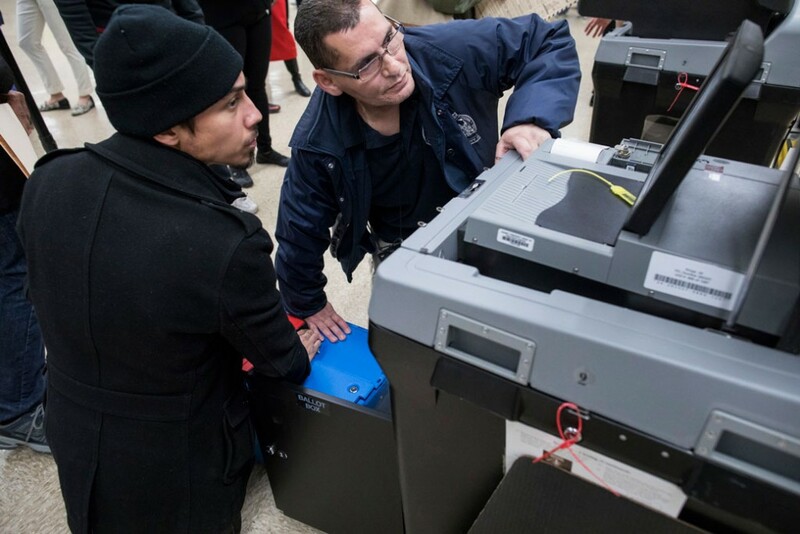 According to one study conducted by the Brennan Center for Justice, of the 274 election officials surveyed in 28 states, more than half said that they will need new voting machines by 2020.32 Unfortunately, 80 percent of those officials said they did not have the necessary funds.